Since the past few months, I include rice water in my hair care and skin care routines. It is a kind of safe, cheap and easy home beauty treatment that you can try. The results can be seen after a few weeks or sooner if you apply it regularly. Now my facial skin tone is a bit brighter although the dark spots not yet faded and my black hair is shiny, healthier and smoother. I can say that good results more noticeable on my hair strands since my previous hair was coarse, dry and tangled. Thus it works for me, girls. 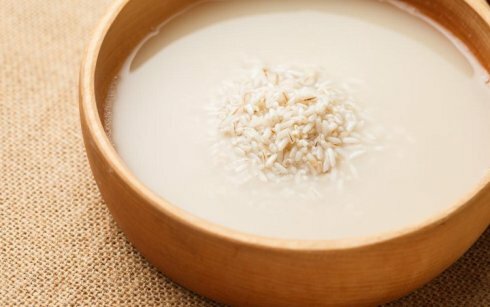 If you want to know more about rice water, continue reading. The water used to wash rice grain is not a waste matter; it turns out that rice water has many benefits for beauty. To get clear and bright skin, many women are willing to try various skin whitening products that are quite expensive. Actually, there is another way to get clearer skin which does not need a lot of money, yep, you can use rice water. Rice contains several substances that can be used for beauty, the essential content contained in rice usually called oryzanol that has the ability to ward off UV rays into the skin so it is very good for skin health. Rice water is full of vitamins, minerals and amino acids that are important for healthy hair and skin -including ferulic acid, powerful antioxidants, and allantoin- which contain anti-inflammatory properties. There are still many other ingredients that also very good for skin health. I cook the grain for my meals while I put the water in used plastic bottles of face toner products. Using facial cotton, I apply the water to wash my face every morning and night before bed or at all times I want. For my hair care routine, I use rice water as hair conditioner every after shampooing. Pour adequate water on the whole clean hair strands, massage your scalp and leave it for a few minutes before rinsing it off. Clean your face using a cotton ball; gently massaging it into the skin for several minutes. Leave the face dry to make sure it is fully absorbed. Doing it regularly will produce skin that feels soft, firm and radiant. You can also use rice water as a toner. Soak a cotton ball or pad and use it for the face after cleansing to minimize the appearance of pores and tighten the skin. This natural skin toner enhances cell growth, stimulates blood flow, and helps keep your skin smooth and bright. Not only brightens skin, rice water also helps cure acne and cools the skin. Rice water functions as an astringent on the skin, tightening the pores. Its allantoin ingredient can reduce the excessive oil which is one of the causes of acne. Components of starch in rice water are also effective in reducing the effects of eczema on your skin. Dip a clean cloth in the water and pat the entire affected skin. Do it for a few minutes and make sure you dry it. Apply rice water to the rash or other skin inflammation to calm it naturally. A dermatological study for patients with a topic dermatitis states that bathing with rice water twice a day for 15 minutes can improve the condition significantly. Rice water is also used to relieve inflammation and burning skin. This will help the skin recover quickly and prevent further damage. Cold rice water is preferred for treating the sunburn skin. Girls, try at home and hopefully it works well for you.